SUNNYVALE, Calif.--(BUSINESS WIRE)--Quiet Solution, the market and technology leader in soundproofing solutions, announced UL ratings for US and Canada today for two more of their soundproof drywall products, QuietRock 525 and QuietRock UltraSTEEL 527. Both products deliver superb noise reduction, are 5/8” thick, are 1 hour fire-rated, and Type X equivalent. UL assemblies for QuietRock 525 are U386, L591 and W317 which include 16”OC and 24”OC single, staggered, and double wood stud configurations. UL assemblies for QuietRock UltraSTEEL 527 are V464 and W460 which include 16”OC and 24”OC single, staggered, and double metal stud configurations. Various QuietRock models are now part of 29 UL listings, including U301, U305, U309, U311, U320, U331, U334, U340, U341, U342, U440, U451, U453, U455, U465, U473, U493, U386, L591, W317, V464, W460, U376, U385 and V463. Quiet Solution pioneered the soundproof drywall category in 2002, and leads the market with over 90% of installs. The company has 22 filed patents and makes over 25 Quiet®-brand products. A single sheet of QuietRock 525 delivers noise reduction equivalent to eight sheets of standard drywall, reducing noise by 75%. A party wall built with a single sheet of QuietRock 525 on one side of single wood studs delivers an STC rating of 51, meeting building code at lower total cost than other wall assemblies, such as double studs or walls built with resilient channels or sound clips. The low total cost, simplicity and reliability of the QuietRock product line has made it the most popular choice for multifamily and commercial construction such as hotels, hospitals, and offices, as well as remodels and media rooms. QuietRock UltraSTEEL 527 was developed in partnership with Dietrich Metal Framing, the leading manufacturer of steel studs. It was designed to meet the customer need for a superior soundproofing solution on metal studs that reduced labor, didn’t require multiple layers of products, and didn’t rely on failure-prone techniques. It is specially engineered to deliver superior noise reduction for interior walls built on UltraSTEEL, providing STC ratings of 55 or more at lower total cost and with simpler and thinner wall assemblies than other methods. QuietRock-based assemblies may be eligible for LEED points, as LEED standards recognize the importance of improved acoustics. Details of all QuietRock and QuietWood acoustic and fire assemblies are available at www.quietsolution.com/acousticfireassemblies.pdf. Both products are available now throughout North America through traditional drywall distributors and independent dealers. 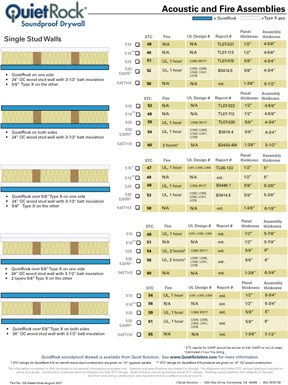 Detailed product information is available for architects, engineers, contractors and builders at www.quietsolution.com.